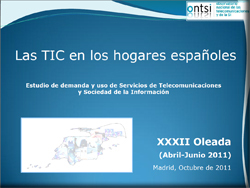 ONTSI presents the 32st edition of its Household Panel report, “ICTs in Spanish households”, corresponding to the period April-June 2011. Expenditure on ICT services incurred by Spanish household in the second quarter of 2011 amounts to €3,357 million, 0.7% less than in the previous quarter. However, this represents a year-on- year increase of € 12 million or, what is the same of 0.4%.